Madurai celebrates the festivals in style - be it Christmas or Pongal; Jallikattu or Chithirai. All the major festivals in Madurai draws huge crowd in Madurai. People from even neighboring places visit Madurai to celebrate the festivals. 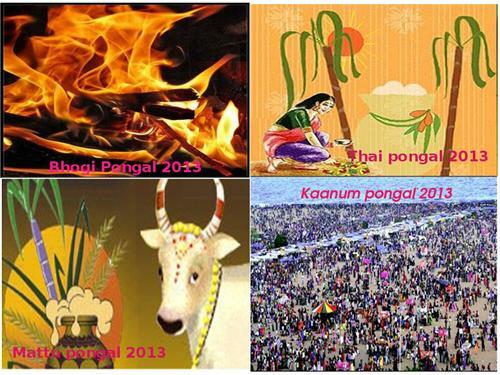 Pongal is also termed as ‘Harvest festival’. This is celebrated during the month of January. Pongal festival is renowned by paying accolade to the cattle, nature and sun for serving them with a prosperous and loaded harvest. This is a three day festival, which natives resided in other town would also come to Madurai and enjoy the festival in their own traditional style with great splendour and pomp. At the first day, Bogi is celebrated. Homes are cleaned and painted with new strike of paint. Old articles are removed and they ensure that there is new fresh look spread all over the house. The second day is the main festival, Pongal. Sugarcanes, hangs of mango leaves and sweet mixture of rice – Pongal makes the day very special. On the third day, Mattu (cow) pongal is celebrated. This day is made special by paying mark of respect to the cattle for fetching in prosperity. Jallikattu is one of the famous festivals in Tamil Nadu that is celebrated as part of Pongal during January. Taming the bull is a popular sport activity in villages, where villagers rush in to show their real spirit and talent. People from neighbouring villages gather in a wide open ground to watch the strength of bull and man pitting each other. As the name implies, this festival is celebrated during the Tamil month Chithirai. Moreover, this is marked on the first full moon day of the Tamil month, which may occur between April- May. If you are planning your trip on a holiday season you would be able to experience real serenity and solemnity spread across the famous Madurai Meenakshi temple. The goddess Meenakshi and Lord Sundareswarar are engaged in a parade to a mirror hall. They would remain on a swing for nine days that would rock softly. This festival is celebrated during the month of September on rejoice of the enthronement of Lord Sundareswarar. A play (lila) is performed where the temple priest recites 64 miracles in form of stories of Lord Siva that protected the Madurai city from misfortune. You can learn as well explore the lifestyle, culture and traditions followed during the periods of Lord Shiva. Navarathri is celebrated in reputation of Goddess Meenakshi (Devi) in all her appearances which symbolizes compassion, wisdom and fury. Navarathri festival is celebrated for nine days and during these nine days, Goddess Meenakshi is presented with nine mixtures of flowers and nine mixtures of rice meals. You would be able to experience real festival joy with visiting all the houses at Madurai. Houses are kept open in evenings, while pooja is practised and foods are distributed to all visitors. Madurai temples are decorated with beautiful lights and special prayers are offered at every hour during these nine days. The tourism department of Tamil Nadu organizes dance festival for fifteen days. Dances of various states and forms are performed during this festival season. Visitors all over the country crowd to watch and enjoy the dances. Dance festival takes place during the months of January, March, November and December. With visiting Madurai during the festival season you would be able to explore and enjoy a rich holiday trip at Madurai city.